Do you want to be the fastest driver on the track? Whether you’re trying go-karting for the first time or already consider yourself an expert racer, our hot go-karting tips will help you perfect your technique and become the king or queen of the track. Before you know it, you’ll be claiming first place and leaving the other drivers in the dust. Before you begin, you’ll need to decide if you’d like to race indoors or out. As the UK is infamous for its rainy weather, an indoor track means you can race even on the foulest of days. On the other hand, indoor tracks are normally smaller and narrower, which makes overtaking other karts more challenging. On indoor tracks, you’ll also find plenty of fun and cool features like bridges and tunnels. However, the close track walls can be pretty unforgiving if you fail to navigate them properly. Since outdoor tracks tend to be larger, you can easily overtake other drivers and reach higher speeds. As such, professional go-kart drivers often prefer outdoor tracks, which means you could be racing with some of the best on these circuits. As with any sport, it’s important to be prepared for the track. Regardless of where you’re racing, you need to have the right gear. You’ll want to wear comfortable yet durable clothing. Jeans and a loose-fitting t-shirt are ideal for wearing to the track. You don’t want to be restricted by clothing that’s too tight or worry about keeping your favourite shirt in pristine condition. You’ll also want to wear a pair of trainers as you won’t be allowed to wear open-toed shoes or heels. When you arrive at the track, you’ll be given a pair of overalls, gloves and a helmet for ultimate protection. If you have long hair, you’ll need to tie it back and tuck it into your overalls, so it’s good to have a hair tie on hand for this purpose. When trying on your helmet, make sure it fits correctly. The helmet should be snug but not so tight as to be uncomfortable. Remember that you’re likely to be wearing it for a while. Ask a member of the team if you’re worried about the fit. An ill-fitting helmet can be a serious distraction when zooming around the track. Once you’re geared up, the track team will brief you on the rules. It’s important that you pay attention, as failing to follow the rules could see you disqualified, and you certainly won’t reach the podium that way. Rules are in place to help keep you and the other drivers safe. Erratic and over-aggressive driving can be very dangerous and even slow you down. 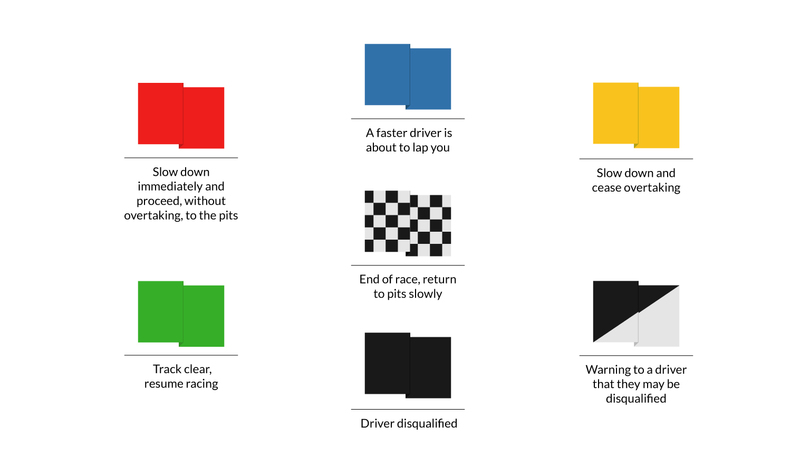 All tracks use different colour flags to communicate with drivers. It’s useful to know what each flag means to make sure you’re following the track team’s directions. Below, you’ll find explanations for some of the most common flags. The first step to a podium finish is to make sure you have the right seat position. You want to be able to comfortably reach the brakes and throttle. With the ideal seat position, your legs should be slightly bent and your feet should rest lightly on the pedals. Your arms should be able to reach the steering wheel without too much of a stretch. Most go-kart seats and pedals can be adjusted to reach the perfect position. Some tracks even provide padded inserts for smaller drivers. Top Tip: Rather than leaning into the corners, try to keep your body completely centered so that your weight is evenly distributed in the kart. The best kart drivers have mastered the art of using the brake. Most go-karts come equipped with a left-foot brake, which saves time as you don’t need to switch between the accelerator and brake. Getting used to this can take a bit of practice, especially if you’re used to braking with your right foot as you would in a car. You want to avoid slamming on the brakes, as this can cause your car to lose control. Go-kart brakes are typically located on the rear axle, which means that brakes are only applied to the back wheels. As such, pushing the brakes too hard can cause the back wheels to lock and the kart to slide out. While most people think of brakes as only a way to reduce speed, the best drivers know that they can also help you go faster. When approaching a corner, you want to slow down your kart enough so that it can zip around it without losing grip and sliding out. Keeping it tight around the corners can give you a competitive edge over other drivers. Top Tip: Don’t apply the throttle and brake at the same time as this could cause you to spin or lead to the engine cutting out completely. Instead, aim to transition smoothly between throttle and brake by easing off one before moving onto the other. Applying the throttle properly is just as important as effectively using the brake. In most go-karts, the throttle is the right pedal and pressing it powers the engine. The harder you press the pedal, the more power you get. While it may seem tempting to put the pedal to the metal to get the most speed, professional drivers understand the value of throttle control. You want to use the throttle carefully and smoothly to get the maximum speed. Giving the throttle too much power during corners can slow you down by causing you to slide out. If you feel the go-kart starting to slide, ease off on the throttle as this will allow the wheels to regain their grip on the track. Top Tip: Study the more experienced drivers to assess the racing line and determine where you should re-apply the throttle when cornering. In addition to properly using the brake and throttle, speed also relies on expert steering technique. You should grip the steering wheel at the ‘quarter to 3 position’ with both hands on either side of the wheel. This position allows you to use your largest arm muscles, so you can maintain control with minimum effort. Experts recommend keeping your hands here throughout the entire race for best results. You want to avoid turning the wheel too sharply as this can result in over or understeer. Understeer happens when you move the wheel too quickly as you enter a corner, causing the front tyres to lose traction. On the other hand, oversteer happens if you move the wheel too quickly when exiting the corner, causing the rear tyres to lose traction. Top Tip: Grip the steering wheel loosely and try to remain relaxed as this will give you better composure on the track. Every go-kart track features corners and getting these right can make the difference between the fastest and slowest driver. Before you start the race, try to get a look at the circuit and identify key corners – ones that lead onto a straight section of the track. Maximising your momentum for these parts of the circuit is essential for gaining a competitive edge. To truly master the race circuit, you’ll need to be the fastest on the corners as this is where most novice drivers fall behind. We recommend using the racing line as a guide for where you need to adjust your steering or apply the brakes. The exact trajectory of the racing line (the optimal path for quickly moving around the track) will depend on the sharpness of the corner and length of the following straight. Ultimately, you want to try to gain as much momentum as possible as you enter and exit the corner. As you approach a corner, try to keep the go-kart wide as this will minimise the amount you’ll need to turn, creating an easier entrance. Once you enter the approach, take your foot off the throttle and apply the brakes. Slowing down for corners will give you more control and help you avoid sliding out. Now that your speed has been reduced you can turn into the corner, how much you need to turn will be determined by the sharpness of the corner. As you turn, try to aim for the apex – or central point – of the turn on the inside. Ideally, you want to reach this point during the middle of the turn. Top Tip: When racing in wet conditions, the best drivers often find the most grip off the racing line so you may need to adjust accordingly. Once you’ve hit the apex or central point, it’s time to start your exit. Now, you want to aim towards the outside of the track as this will allow the kart to swing wide and pick up momentum. As you straighten the wheel, re-apply the throttle to give the engine more power. Increase the pressure on the throttle as you continue to exit the corner, so that you’re at full power and the wheel is corrected by the time you hit the straight stretch of the track. To successfully master the corners it’s important to perfect your “slow in, fast out” technique which requires understanding the right place to apply the brakes. As you exit the corner, you want to avoid accelerating too late or too hard as this will slow your speed and throw you off the race line. Instead, focus on picking up as much speed as possible during your exit so that you can slingshot past your opponents. Remember that every corner is slightly different, so you may need to adapt the above approach to suit the circuit. More experienced drivers are able to transition quickly from easing off the throttle when entering the corner and powering up on the exit. Top Tip: Going around corners will inevitably slow you down so it’s important to get your kart pointing straight as quickly as possible to reach the highest speed. Once you’ve mastered the art of entering and exiting corners, you can start to think about overtaking. Corners are one of the best places on the track to overtake your opponent and your success here will depend on how smoothly you can brake and accelerate around them. Always make sure it’s safe to overtake before doing so, ensuring there are no obstacles in your way. When you’re ready, move to the inside as this will put you in the best position to pass drivers that understeer in the corners. It’ll also allow you to pick up the most momentum so that you can leave other drivers in the dust. Hairpins and chicanes are common forms of slow-speed corners well suited to overtakes. When approaching hairpin or chicane corners, less experienced drivers often brake earlier than necessary. By braking later, you can gain a competitive advantage and speed past the drivers that brake too early. While corners are certainly one of the best places to overtake, drivers can also use slipstreams on the straights. Every moving object encounters wind resistance, known in the racing industry as drag, when travelling at high-speeds. The lead driver will need to overcome this challenge to stay ahead. You can use this to your advantage by driving in the space directly behind the lead driver. Since the lead driver takes the brunt of the drag, this space acts as a partial vacuum without wind resistance. By staying here till you’re ready to pass, you’ll be able to build up the necessary momentum for quickly overtaking. Top Tip: The best drivers use their judgement and bravery to brake as late as possible when overtaking competitors into corners. Now that you’ve got the top tips and tricks, you’ll be ready to hit the track and start training for the Grand Prix. Who knows, you may even become the next Lewis Hamilton! Activity Superstore has discounts on some of the best karting experiences in the country. We’ll help you release your inner speed demon with a 50 Lap Karting Race, dominate your opponents in an indoor karting session, or encourage the young ones to learn the art of racing with Junior Karting. If you’re feeling brave enough, why not race around in a speedy supercar or go off-roading on a quad bike? Activity Superstore offers some epic driving experiences perfect for drivers of all ages.